Researchers at Oxford University Clinical Research Unit (OUCRU) have recommended improvements in slaughtering and hygiene to limit cross-contamination with non-typhoidal salmonella, particularly in poultry wet markets in HCM City. The researchers made the suggestion after finding non-typhoidal salmonella contamination in meat at these markets. Nguyen Thi Nhung, OUCRU’s microbiologist, said that between October 2016 and March 2017 her research team purchased 117 samples of chicken meat, beef and pork from retail sites including supermarkets and wet markets. Tests showed that 68.4 percent of the samples contained non-typhoidal salmonella, which causes gastroenteritis if the meat is not cooked well. Based on EU 2014 surveillance data, the prevalence of salmonella in 25g meat samples was 2.26 percent, 0.6 percent and 0.23 percent for chicken, pork and beef, respectively, she said. Respective figures in the OUCRU study released on January 26, with samples from HCM City, were 71.8 percent for chicken, 70.7 percent for pork and 62.2 percent for beef. While most non-typhoidal salmonella infections are self-limiting, some can become severe depending on the number of salmonella bacteria present, she added. OUCRU researchers also examined how resistant the salmonella in the meat samples was to antibiotics. The researchers grew the salmonella isolates in the lab, and then exposed them to 32 different types of antibiotics. Up to 52.2 percent of salmonella isolates were multidrug resistant, meaning they showed resistance to at least three antibiotic classes. It was the first time that bacteria resistant against colistin, a last-resort antibiotic, had been identified in meat in Vietnam, Nhung said. People can become infected with these antibiotic-resistant bacteria when they handle raw meat or undercooked meat, eggs and vegetables, James Ian Campbell, a microbiologist at OUCRU, said. To avoid infection, people should wash hands after processing meats and carefully wash raw vegetables, he added. Juan J.Carrique-Mas, veterinary epidemiologist at OUCRU, said that hygiene was critically important during slaughtering and food processing. 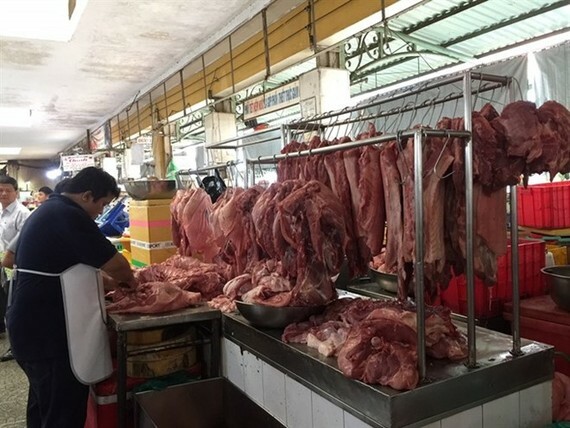 To limit the hazard of residues in animal products, more measures to promote responsible antimicrobial use in animal production as well as awareness about withdrawal periods, should be carried out in Vietnam including HCM City, Carrique-Mas said. In a meeting between the Ministry of Health and the Food Safety Management Authority of HCM City last week, Deputy Minister Nguyen Thanh Long instructed the authority to work with agencies to strictly manage traditional markets. More attention needs to be paid to breeders, foodstuff for pigs, chickens and other animals, he said. The city authority is setting up procedures for breeding, transport and slaughter in food safety chains with neighbouring provinces to ensure food safety, Long said. “Bacteria contamination in meat is often caused during transport and slaughter,” he said, adding that currently, the city and certain agencies only control the origin of food. 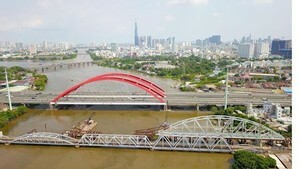 Pham Khanh Phong Lan, head of the Food Safety Management Authority of HCM City, said the city would step up enforcement at markets, especially at illegal ones. The city is piloting a model called Safe Food Traditional Market at Ben Thanh Market in District 1 and Hoc Mon Wholesale Market at Hoc Mon district. More unannounced inspections will take place in the city, and rapid tests of food including meat will be done every day. If inspectors find banned chemicals or bacteria contamination, the sellers will be forced to seal all packages of this food and will have to contact an independent testing organisation to test the food again, Lan said. The city plans to work with independent testing organisations to find ways to speed up testing procedures, she added.